Not all vinyl windows are the same. This unedited photograph shows one of our vinyl windows, a horizontal slider, bending severely under the intense, focused positive pressure equal to more than 125 miles per hour winds. This same pressure is also applied negatively, simulating the flexing in and out that the windows in your home will experience when Mother Nature turns nasty. 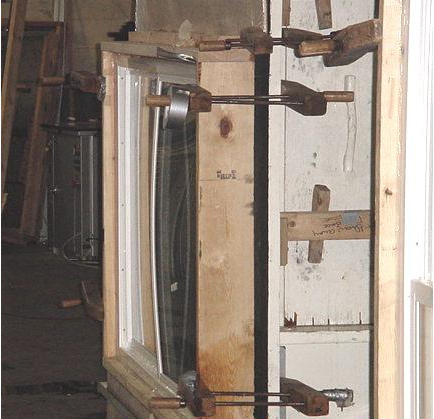 We pay significant fees to independent labs licensed by AAMA to fasten our window specimens from our production line to the wood buck you see above, clamp it in place, and torture our products with increasingly high pressure wind and water – until it eventually fails. The last measure of success before it fails in each category is the declared performance rating of that category. The window is graded by virtue of its lowest score, usually water penetration under very high pressure and volume over time. The grades are one of five, raging from Residential to Architectural. Our engineered designs feature among the best performance ratings possible for residential windows. For specific details, consult your Don Young Window Representative.